Also known by the names double half hitch and clove hitch around itself, this knot is an overhand knot followed by a half hitch. The Ashley Book of Knots states that Steel gave it its name in 1794. It can be tied around a ring, dock, post, tree, etc. It is commonly used in mooring and general utility. It is helpful in moving large objects, for example, logs. Pry apart the 2 hitches with a bending motion to untie. It is secure only when it is tied tightly around the support. Capsizing the 2 half hitches might end up making the granny knot, one of the poorest performing knots. 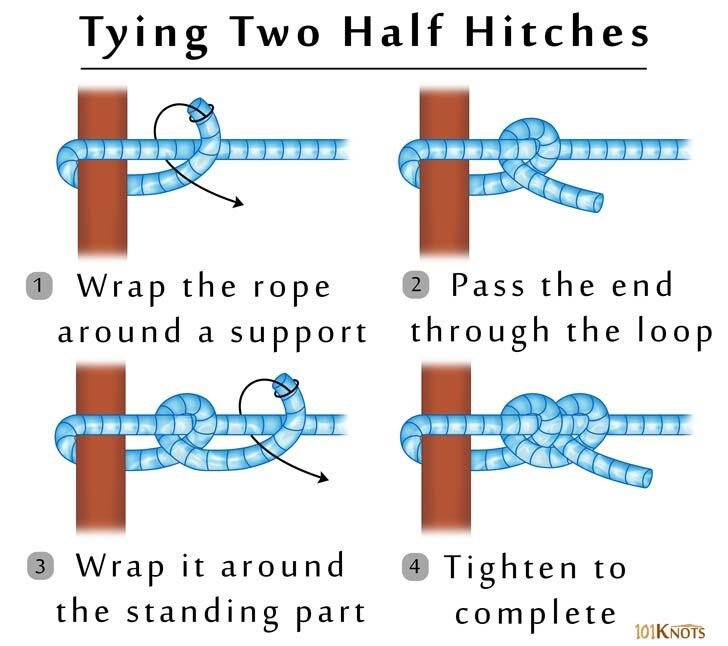 Slipped double half hitch – Easier to untie. Here, a bight of the rope is passed through the second half hitch instead of the free end. 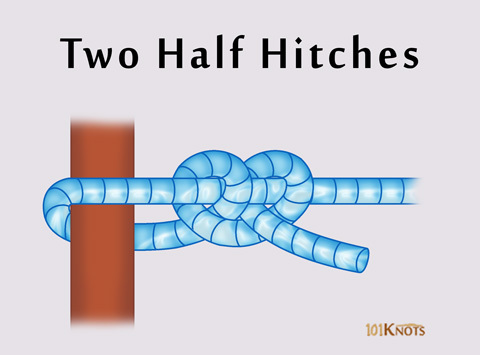 Round turn and two half hitches – The double half hitch is a part of this simple knot. It is better for securing things to boats and posts having small diameters. It is easier to untie. Apart from the above, the vertical, horizontal, diagonal and reverse double half hitches are unique variations used in macramé patterns. Clove hitch – It is tied directly to the spar, unlike the two half hitch knot that makes a turn around the spar before being fastened around its own standing part. To tie guy lines to a dining fly. Securing the ends of a rope that ties things to the top rack of a van. Two half hitches and a taut line hitch are used to set up tents. When added to a timber hitch near the hauling end, helps in hoisting and prevents the load from twisting. Stringing tennis rackets and fly tying in fishing. In casting methods for cattle handling. Buntline hitch – More secure but more liable to jam.